Export the data to your disk. Sometimes you can simply download it; other times, you’ll need to create an extract. Load it into a spreadsheet program. Note that this will require you to export it in some standard format. That spreadsheet program can be something on your computer like Excel, Numbers, or LibreOffice; or it can be Google Sheets or some online program. Sort it by some numeric field and try to identify the outliers or, better, errors. Google spreadsheets has just added in a number of automatic charts. Load as much of the data as you can into a single spreadsheet and look at the automatically generated results. Share the spreadsheet with Dave with no more than 20 words and a url describing what the data is. Your source of data need not be different from everyone else in the class, but your bit here should be. Based on 3 and 4, whichever is more interesting: screenshot that and send it with a paragraph-long gloss on what it shows to me and Dave. For example (by which I mean, don’t analyze this exact chart but one that you make): I made this chart from some subset of the Atlantic Slave Trade database. 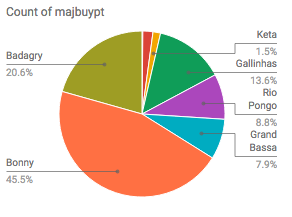 What does “majbuypt” mean? Why is ‘Bonny’ the most frequent entry? What do you learn about the slave trade and/or the particular data included here based on the example? What kind of paper could you use this data in? Dave has put a list of historical crowdsourcing projects online. Sign up for one on the Google Sheets, or find something else that you are interested in. Note that some of these require you to actually have something to contribute: if you don’t have a story about the Boston Marathon Bombing, you won’t be able to sign up. On the other hand, others just need your help in transcribing. Write a post on the course blog describing your experience. How did they make the task engaging (if they did)? Would you contribute more? Is the data that the project is gathering worthwhile? Are there good integrity checks? And so forth.